Student Life at St. Clare School develops our students’ unique talents in Academics, Arts, Athletics and through Service and Faith. The wide variety of activities at St. Clare provides a strong foundation for a very bright future and the opportunity for parents and faculty to work along side their children. Early exposure to the arts develops critical thinking skills and creates brain connections in children creating a long lasting impact on their future. Our students in grades 4-8 may participate in the band. They receive instruction 3 times per week with band rehearsals and sectionals. In addition to performing at concerts, students individually perform and score very well at our District contest. The concert band consistently earns a 1st Place or 1st Superior rating at the District Organizational Contest. Their hard work and dedication is evident in every performance. The chorus provides a growth opportunity for students to develop their vocal talents while gaining experience with public performances. Our choir also works to enrich our school liturgies and they compete in the District Contest. They also share their talents by performing for senior groups, nursing homes, and other concerts. Grade appropriate lessons involving art history and a related art project. Through service to others, we learn compassion, we follow Jesus, and we deepen our faith – traits by which strong character is formed. This group of 5th-8th grade volunteers learn that service should be a normal part of our everyday lives. Pondering “Why are we here?” and “What can we do to make our part of the world a little bit nicer?” are the impetus for St. Vincent de Paul. Helping others has a wonderful ripple effect. This group actively engages in volunteering activities to help those in need. Some of this is done through fundraising; other times it is through the generous donation of their time and talents. They use their talents to make blankets and host events to raise funds for specific projects or groups. The Student Council is a group of peer elected students chosen to represent the student body. The members of the Student Council need to maintain good grades and continue to be positive role models for the other students. They meet weekly to plan fun school-wide events like pep rallies, Spirit Week, and assist with the talent shows. This group not only teaches students responsibility and accountability, but also reinforces the need to put others needs first. Our Buddy Program is one of the highlights of St. Clare School. Students in Kindergarten, 1st, and 2nd grade are partnered with a 5th, 7th, and 8th grade Mentor. Buddies go to Mass, read books, make crafts and go on field trips together – they share in the benefits of each others experience. It’s a toss-up as to who benefits the most: the little buddy or the big buddy. Our Safety Patrol is made up of 7th graders, who work to assist students in safely crossing at the four-way intersection after school. By donning vests and carrying stop signs these students work along side the crossing guard and teachers who are around our campus providing a safe environment for our students. Our Junior High students volunteer weekly to tutor younger students in subjects where additional attention is required. This activity teaches patience, understanding and good communication skills for both groups. Caring for our environment is as important as caring for others. Recycling is part of daily life at St. Clare School. We have been honored several years in a row by St. Clair County for the overall amount of recycled material we collect. Students experience time away from ordinary schedules for the purpose of reconnecting with God and their faith community. Eighth graders early in the fall share faith in a day long retreat as a foundation for the school year. 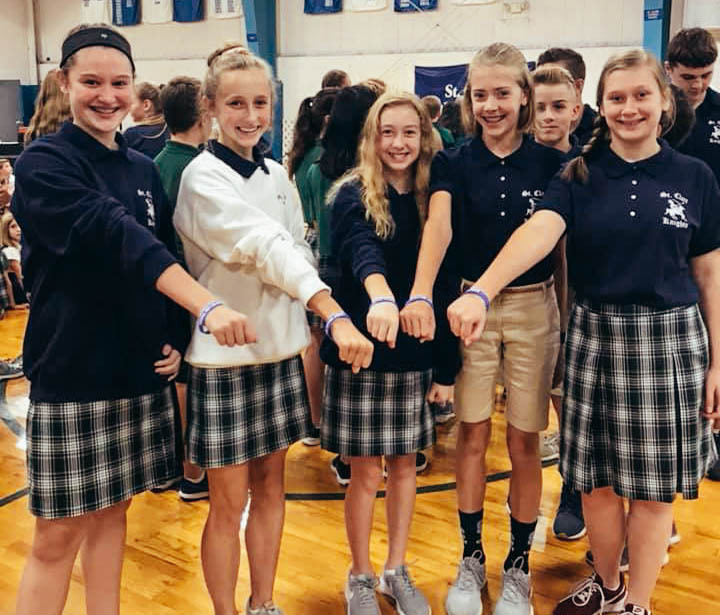 Students in grades 4-7 devote a half day focus around faith sharing prayer and discussion of personal relationships with Jesus. third grade students experience a faith topic together through art, music, and guided meditation in a two hour retreat. Scouting programs are offered for both the boys and girls of St. Clare School. Focusing on service and personal development, the scouts and their families have fun and adventure in a program that builds character and instills values. Academics are the cornerstone of a great school. At St. Clare, we know these academic experiences enhance the learning environment, allowing our students to excel not only at St. Clare but also in their future. Students completing 6th- 8th grade with a 93 or higher grade point average, and who lead lives reflecting well on their school, their church, and their community, are invited to be inducted into the Honor Society. Hands on, after school, science program that makes learning scientific principles fun. Sixth grade students participate in the D.A.R.E. (Drug Alcohol Resistance Education) program. During St. Clare County Sheriff's Department 10-week program officers come to school weekly to help reinforce drug prevention education and teach students good decision making skills to help them avoid high-risk behavior to ensure they grow up healthy, safe and secure. The Speech Club is comprised of students in grades 5-8 looking to develop their public speaking skills. Students memorize and perform Humorous, Serious, or Duet speeches to compete in speech meets at Diocesan schools. Chess is a classic game of strategy and skill that can be learned and enjoyed at a young age. The team is comprised of students from first - eighth grade who play in several tournaments a year. Students compete against other junior high students in teams of five. A series of general knowledge questions are asked as they compete for points. This is a higher order thinking contest sponsored by the St. Clair County Office of Education. Teams of four students compete against students from other schools in the county. Competition includes logic problems and “engineering-type” building problems. This contest is sponsored by the Althoff Catholic High School Science Club. Teams of four students compete in a series of activities, based on a central scientific theme. Activities may include lab skills, engineering type problems, measurement skills, etc. Exposes students to technology and programs they’ll encounter in high school and beyond, plus.